Response Templates for Microsoft Outlook (works with Microsoft Outlook 2003, 2007, 2010) is an intuitive addin that allows you to create and store email templates used for replying to frequently repeated email questions with a single click. Using an easy to retrieve folder storage system built into Microsoft Outlook, Response Templates enables you to easily find and insert the items you need (including text snippets, sentences, paragraphs, URLs, attachments, etc.) into your emails. Using drag-and-drop or by simply double-clicking on the stored item, it will be automatically inserted into the active Outlook email window. Moreover, Response Templates can also be used when sending new messages or for adding information to forwarded emails. 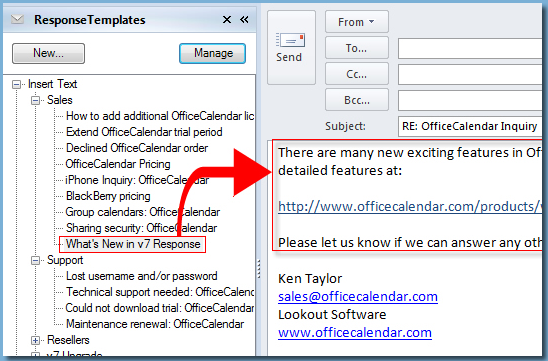 Also supported with Respsonse Teamples are Outlook HTML email templates (Outlook message templates). These are primarily used for composing new email messages. Outlook Message Templates are email message created using Microsoft Outlook and saved in the .MSG or .OFT file format. This type of template would typically be used for sending highly graphical emails like new product announcements, customer newsletters, monthly sales promotions, etc. This site does not contain serial number, crack, keygen Response Templates for Microsoft Outlook serial number : serial number is the simplest type of crack. A serial number(cdkey,product key,etc) is register the program as you may already know. a crack or keygen may contain harmful software. If you cannot find the exact version you want, just give it a try. for more information read .nfo/.txt/.diz file include in zipped file.